It all started with one very expressive newfie puppy and a newfoundland breeder who needed help showing her dogs. Newfies are addictive, you soon find you need another. Once we finished Bo, we were hooked. 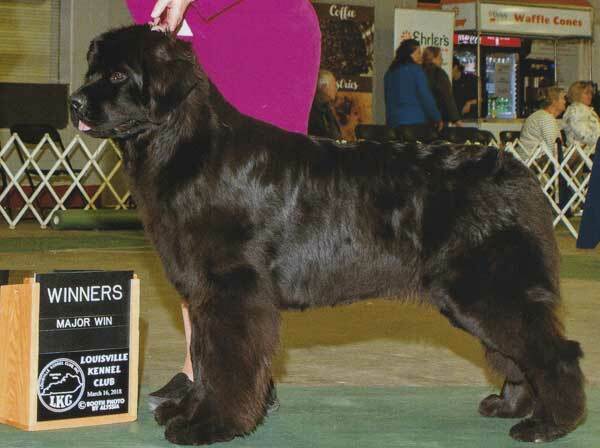 Newfoundland dogs became a passion, a commitment to strive to produce healthy happy newfies. We are now breeding to produce show quality dogs that we can exhibit in the ring, of course there are always a few puppies that we can share with others who are committed to making a Newf part of their family. We do not keep a large kennel, we live with our dogs and would like anyone acquiring a Newfie puppy from Belle Harbour to do the same. Belle Harbour Newfoundlands got its name from the harbor that is just left of our Clear Lake, Iowa home. In October of 2012 we acquired 42 acres in Winnebago Minnesota. The move was done with our dogs in mind. We selected the property with the happiness and comfort of the dogs as a priority over our own. Their new home includes 42 wooded acres, a pond and a river runs through the property. We are members of the Newfoundland Club of America, the North Central Newfoundland Club and the American Kennel Club. We are actively involved in AKC conformation shows as well as water work and other competitive events. We will be exhibiting our dogs in the Mid-West and East Coast states and invite you to visit us anytime. Newfoundland Puppies are planned in the coming months and there may be puppies available to approved homes. All of our dogs are examined by board certified cardiologists for healthy hearts and xrayed to insure healthy hips and elbows before breeding. We test for Heart, patellas, thyroid, cystinuria, hip and elbow dysplasia, as well as eye diseases.